Not the most rewarding day, as we made haste to head south through an area where numerous stops were made on past trips. Czech friends at ELK had suggested a spot to the west of MEX 57 to Los Colorados. Not sure if we had the rights place, but the track that we turned onto went through a gate waring us that we were on private property of Rancho San Luis ‘Prohibido cazar o tirer basura’ (Hunting and rubbish dumping prohibited. So looking for and taking photos of cacti was assumed to be OK. We drove 24 km along a dead straight road and saw no one. Then there was the track to the south that we had to follow for another 6.5 km. After 4 km the track became very poor with deep ruts, much wider than our wheels so common sense decided to make this our turn around point. Another 2.5 km would have taken us nearer the foothills, but not actually to them, so we decided to drive back to a small hill that we had passed on the way and try our luck there. 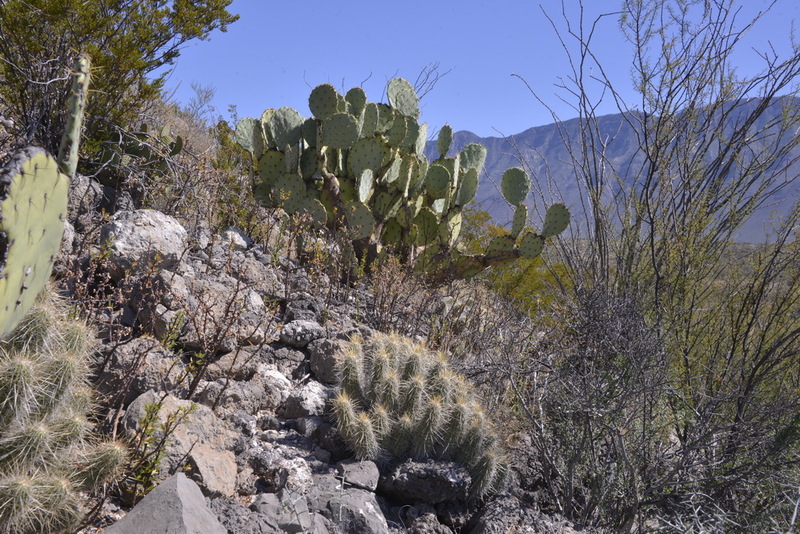 A nice enough crop of cacti, but nothing spectacular. We found rooms in the wonderfu;l Hotel Santa Rosa in the village of General Cepeda, having miossed it somehow on previous drive pasts in 2010 and 2011. Found a nice enough and very friendly restaurant on the village square and on the way ‘home’ passed a shop that sold ‘cowboy hats’, so another one was added to the PK Hattery collection – just about one for every trip. Pictures will have to wait until day light tomorrow.